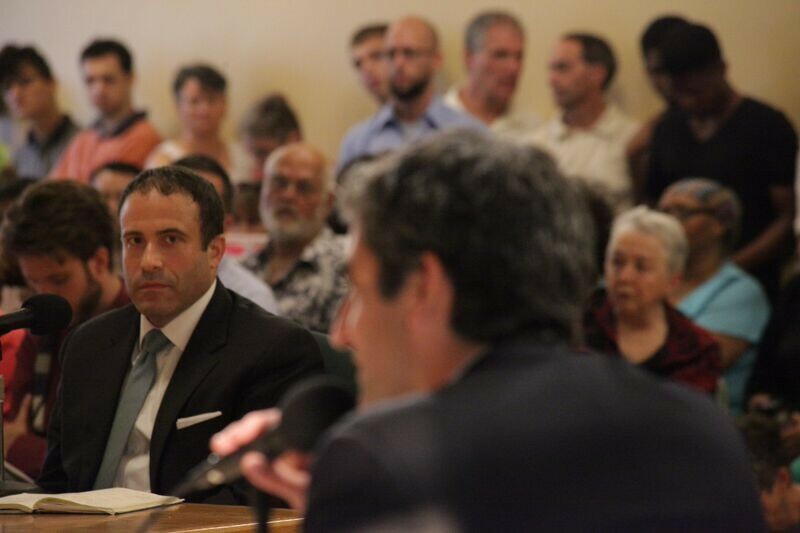 Brandon del Pozo listens as Mayor Miro Weinberger speaks. The Burlington City Council voted Monday night to approve the appointment of Brandon del Pozo as the city’s next police chief, following a four-hour debate that was at times testy. Del Pozo, 40, is due to start September 1 in the $114,363-a-year job. Mayor Miro Weinberger chose him from a field of nearly 30 candidates. He replaces Michael Schirling, who retired in June. Councilor Joan Shannon (D-South District) abstained, citing a work conflict of interest. The remaining 11 councilors voted for del Pozo. Despite the council’s support of del Pozo, it was a tumultuous evening. About 130 people filled city hall’s Contois Auditorium, the majority protesting del Pozo’s appointment. A long line of critics argued that del Pozo should be rejected because of his 18-year career with the New York Police Department, where he is a deputy inspector. Some blatantly accused him of being responsible for the department’s racial profiling, systematic infiltration of Muslim communities and mistreatment of protesters. “Every time I step in this city I’ll be under his jurisdiction. Give it some time. Don’t make this decision tonight,” said Mark Hughes, a black man from Marshfield. Former city councilor Ed Adrian later took the mic to call critics on their summary link between del Pozo and problematic NYPD policies. “The police chief is being profiled,” he said, noting that opponents were making assumptions about his work at NYPD. The debate drew protesters to city hall. Schirling told councilors that he strongly supports his successor, with whom, he said, he’s spent considerable time during the candidate search process. “The vilification you’re hearing does not match the man,” Schirling said. Del Pozo, in responding to criticisms, condemned profiling and said critics had misinterpreted his background. “I had absolutely no part in surveillance of any individuals,” he said. 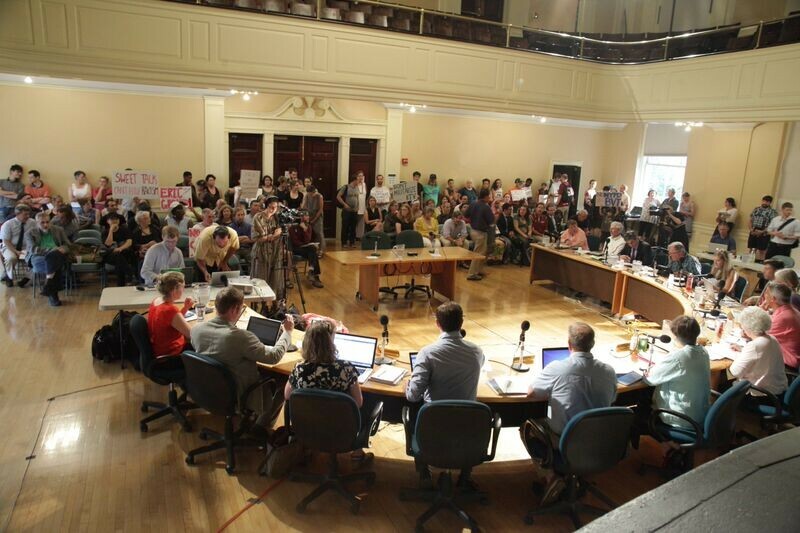 Councilors rejected calls to delay the appointment so that more community forums could be held. The city had already conducted a lengthy process in which diverse panels of residents weighed in, said Councilor Tom Ayres (D-Ward 7). Councilor Sara Giannoni (P-Ward 3) said greater public input was warranted. Del Pozo said his wife, watching Monday’s night meeting online from the Adirondacks, told him he didn’t need to put up with the kind of criticism he was facing. He said he texted back that it was all part of democracy.